It’s been a while–sorry! First, I was too exhausted and mad at you from dealing with your absolutely horrific toddler behavior. We had a few real doozies in the past week. Then I was in long-weekend movie-watching mode. But now we’ve kind of gotten back to normal, whatever that is. You had a little bit of a meltdown this evening at the dinner table because you kept asking for things (more hot dog roll, more chips) that we weren’t going to give you. But you actually did a good job of calming yourself down and taking the time and space you needed to do it. So yay! This is progress. Otherwise, you’ve been pretty wonderful over the past few days. You’ve been sweet, cooperative and generous. You’ve generally followed directions and listened well. 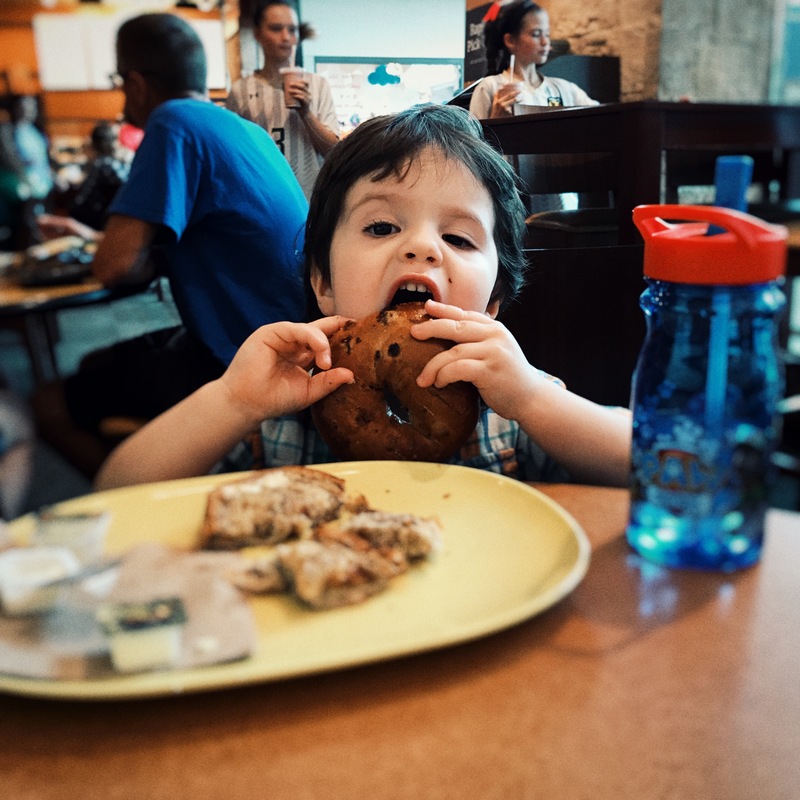 We took you to Panera for lunch on Saturday, and you sat so beautifully at the table–barely moving or making a peep while you polished off an entire bagel–I texted Nonna to ask if she’d seen any pigs flying around. Last night, after a busy afternoon spent playing hard at D’s birthday party (and running off the sugar consumed) and then an evening visiting with your great-grandparents, we sailed through your bedtime routine with remarkably little pushback from you. When we settled into your chair for snuggles and a song, you nestled into me and threw an arm around me. I squeezed you back and told you I love you. “I love you too,” you said. I had to pick my jaw up off the floor. That was a first! And then, when I got you tucked into bed, you asked for your puppies. I piled them up near you–Marshall and Tonka and Speck–and you put your arm around all of them and said, “Mmm, this is comfy.” I love that you express these things. 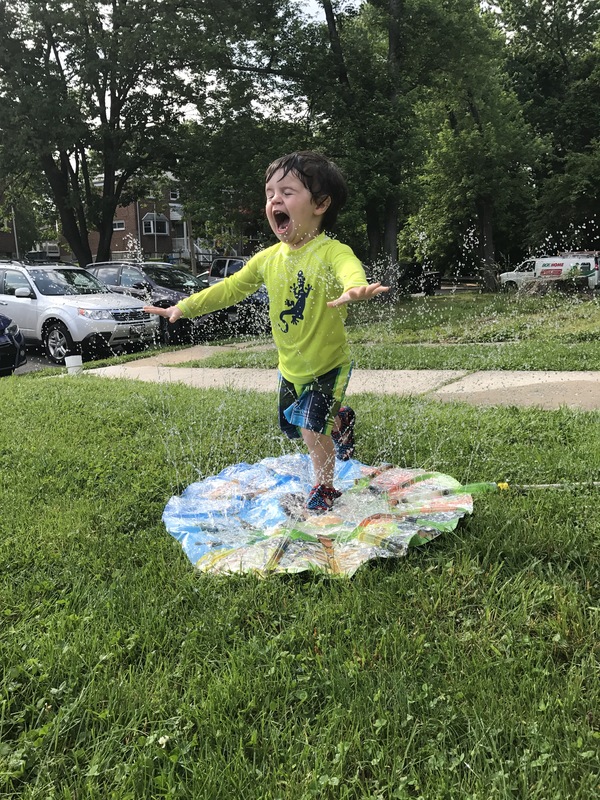 Today, amid the Memorial Day sprinkler play (thanks, Nonna, for the new Paw Patrol sprinkler toy!) and frozen yogurt pops, while you were waiting for our traditional barbecue dinner to be served, you did a somersault all by yourself. And it was graceful and completely unhindered by any sort of hesitation. You just never stop amazing me.